wirelessly flip back and forth through PDF pages on an Apple iPad – completely hands free! As magical as the page flipping appears, initial set up of the device may require a little bit of guidance for the first time user. Therefore, we will present a set up procedure in a 3 step process so that one can quickly begin to appreciate the benefits and convenience of the BT-105’s marvellous, hands free page turning capabilities. AirTurn provides the solution for anyone who needs the hands free convenience of flipping PDF pages both back and forth on a tablet or PC. For musicians, the Air Turn BT-105 is brilliant and here’s why. The Airturn BT-105, along with a pair of footswitches permits you to communicate hands free, with your iPad. Musicians who are reading digital sheet music on the iPad need both hands to play their instruments and the Airturn BT-105 is the perfect solution. The BT-105 is the ‘brains’ of the system that connects with the iPad through Bluetooth. Commonly used momentary foot switches can be connected with the Airturn BT-105 to activate the forward and backward movement of the digital pages. Although the AirTurn BT-105 works with a wide range of pedals and momentary switches, including Boss FS-5U foot switches, as well as bite and tongue switches, Airturn offers a footswitch, the ATFS (Air Turn Foot Switch) which is designed to be completely silent when pressed. The Airturn ATFS is the perfect solution for performing in a recording studio environment or during an intimate live concert when the ‘click-click’ of a foot switch would be distracting and unacceptable. The BT-105 is available alone or in a variety of combined packages from Airturn. The combination of the BT-105 with 2 ATFS-2 Pedals and Pedal Board is all that is required for page turning purposes. One special quality we are pleased to mention about AirTurn, is the companies attention to detail, particularly towards the needs of musicians. Hugh Sung, an accomplished musician, is the co-founder of AirTurn which explains why the products created and marketed by AirTurn are particularly connected to the needs of musicians. However, the AirTurn page turning feature is obviously useful to any person who is in need of a hands free PDF page controller for the iPad as well as most other Tablet devices, including desktop or laptop computers. Hugh Sung’s book entitled ‘From Pixels to Pages’ is a guide for musicians making the transition from paper sheet music to digital sheet music readers and apps. From Pixels to Pages is written in a light, easy style that is a welcome reference for even the most techno-phobic individual. Taking a few minutes to Meet Hugh Sung is worth the effort because you will get to know a little more about the the interesting person behind Airturn as well as Hugh’s passion for his inventions. 1. The AirTurn BT-105 can be configured to communicate with these various computer devices in a few short seconds by way of button/switch combinations. Out of the box, the first time user may find the set up procedure a little bit confusing but the many online videos posted by AirTurn as well as other support postings on YouTube are very helpful in setting up the AirTurn with your particular type of computer. Learn how to pair the BT-105 and how to configure the unit with the Tablet or the Computer you want to use. Helpful tip – setting the MODE: The instructions describe pressing the little RED button (on the rear of the BT-105) while at the same time depressing the corresponding foot switch. The trick is to REMEMBER to RELEASE PRESSURE on BOTH the red button AND the foot switch at THE SAME TIME as SOON AS THE LED LIGHT STARTS TO APPEAR. The timing of the release is the key to configuring the MODE of the BT-105. Don’t be frustrated if you don’t nail it on the first try, eventually you will get the hang of it and then once the BT-105 is set in the correct MODE for your device, it’s good to go to the next step. 2. Bluetooth configuration – follow instructions from the manufacturer of your particular tablet. HELPFUL TIP: After initial set up, if for some reason the Bluetooth does not find the BT-105, it may be necessary to go back to the Bluetooth setup – FORGET the mobile device, then RE-DISCOVER that same mobile device and everything should then be working again perfectly. 3. To find a list of Compatible Software Programs, visit this link on the AirTurn website. The AirTurn BT-105 is primarily a hands free hardware solution to turn PDF pages on a tablet/computer which must be used with compatible software. As a point of reference, we tested the AirTurn BT-105 using the software UnReal Book, by Aron Nelson. 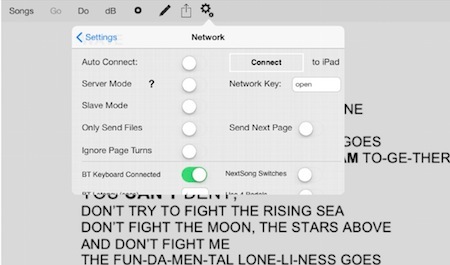 UnReal Book is an App used to organize digital scores, lead sheets and vocal lyrics. Setting up the the software, is the 3rd step, (in addition to the BlueTooth recognition and the Hardware configuration) required to get the AirTurn BT-105 up and running. To complete the software set up in UnReal Book, launch the UnReal Book app, then go to the Apps’ Settings/Network/ and select BT Keyboard Connected. Once you move this slider to the ‘ON’ position, the software will be flipping pages for you when the foot petal is depressed. The setup for the software will be similar in any compatible program, it just may take a little bit of searching to find the particular location of that setup pref. The AirTurn BT-105 with 2 ATFS-2 Pedals and Pedal Board is a quality built, reliable handy device for anyone who needs a hands free solution to turning PDF pages on a Tablet/computer. Once they try it, any musician who uses the AirTurn BT-105 will wonder how they ever got along with out it.